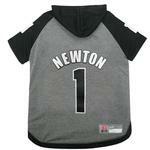 Get prepared for Game-Day with the Cam Newton Dog Hoodie T-Shirt! Football season never looked so good! Your four -legged quarter-back will love sporting the Cam Newton Dog Hoodie T-Shirt on game-day, on the gridiron, or anywhere your Newton fan wants to go! This hoodie tee is officialy licensed and features a woven label for your dogs name. Its comfortable cotton and sporty jersey materials will have your sports fan game ready!